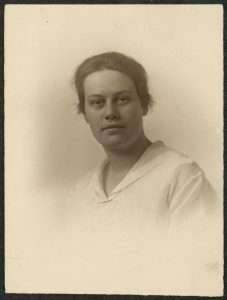 A teacher of physical culture from Buffalo, New York, Janet Fotheringham was 26 years old when she traveled to Washington to participate in the 1917 suffrage protests at the White House. Although little of her life before and after is known, her courageous participation in the protests earned her a place in suffrage history. In July of 1917, Alice Paul, the leader of the National Woman’s Party (NWP), was diagnosed with a severe illness and was preparing for transport to a hospital in Philadelphia. Before leaving, a meeting of the NWP was held at her Washington hospital bedside. Many believed this might be the last time they would see their beloved leader, and eagerly embraced more picketing of the White House to honor and serve her cause. As was customary, the demonstration for the following day, July 14th, was announced in the media. Coincident with France’s Bastille Day, the suffragists inscribed their banners with the French motto: “Liberty, Equality, Fraternity,” and also used the NWP’s tricolor banners. Janet Fotheringham was among the second of three groups of protestors who marched from NWP headquarters across the street to the White House. A crowd formed at the scene, and police made no attempt to disperse them. The first group took their places at the upper gate without incident. However, as soon as the second group took their positions at the lower gate, the police immediately arrested both groups of suffrage protestors. When the third group emerged from NWP headquarters, the crowd applauded as the suffragists took their places. The police waited a timed period of four minutes before arresting them on a charge of “violating an ordinance.” At the police station, all 16 were charged with “unlawful assembly.” In court on July 17 all 16 were found guilty of “obstructing traffic” and sentenced to 60 days at the Occoquan Workhouse, the federal prison in Lorton, Virginia. Family members visited the suffragists in prison and, shocked by their condition, appealed to President Woodrow Wilson. After serving three torturous days at the Occoquan Workhouse, the 16 suffragists – including Janet Fotheringham – were pardoned by the president and released. Sources: Doris Stevens, Jailed for Freedom, (New York, NY: Hard Press, 1920). Inez Haynes Irwin, The Story of the Woman’s Party, (New York, NY: Harcourt, Brace and Company, 1921). Photo courtesy of the Library of Congress.